Citizen science usually isn’t this personal. In 2011, roughly 65,000 Japanese citizens living near the crippled Fukushima Daiichi Nuclear Power Plant started measuring their own radiation exposure in the wake of the Tōhoku earthquake and tsunami. That’s because no one, not even experts, knew how accurate the traditional method of estimating dosage—taking readings from aircraft hundreds of meters above the ground—really was. Now, in a first-of-its-kind study, scientists analyzing the thousands of citizen readings have come to a surprising conclusion: The airborne observations in this region of Japan overestimated the true radiation level by a factor of four. The purpose of this post is to report the most recent and last results from Kelp Watch 2015, a program dedicated to monitoring for Fukushima derived contamination along the Pacific Coast of North America. This post is the latest in a series dedicated to public outreach and dissemination of scientifically derived information about the impacts of the Fukushima Dai-ichi disaster on the health of the North Pacific Ocean ecosystem and health of North American residents. Results from the fifth sampling period (March 2 through June 3 2016) were released on July 15, 2016 and can be found here. As with previously reported results here, here, here, here, and here no radioactive isotopes from Fukushima were detected in kelp growing at sampling sites along our Pacific coast or elsewhere in the Pacific (see sampling sites). The absence of 134Cs in kelp suggests that ocean transport of Fukushima contamination had yet to reach persistently high enough levels in North American coastal water to bioaccumulate in kelp. 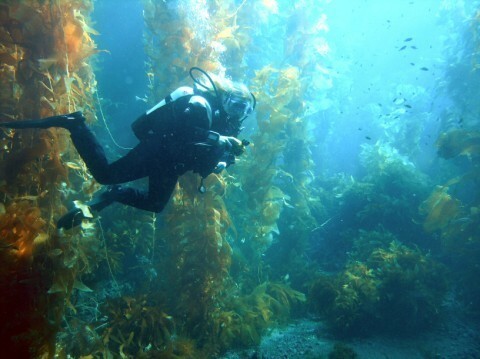 The levels of Fukushima derived contamination in kelp in 2016 will not pose a significant risk to the health of the kelp or other species, including humans, which rely on them as a foodstuff. Coastal monitoring results from samples collected in Sept-Oct 2015. We are partnered with the Bamfield Marine Sciences Centre (BMSC) who coordinate our citizen science coastal seawater sampling in the coastal community of Bamfield on the west coast of Vancouver Island. I received an email today from BMSC foreshore operations Janice Pierce that the sample was sent out with todays mail from Bamfield and headed to UVic for processing. InFORM coastal seawater sample being collected off of Bamfield from one of BMSC’s research vessels. Great winter sky. The location of Bamfield is indicated on the map below.